I think that one belongs to a member here. Looks like a really nice car. Good car for collectors, I'd be nervous driving it around. $30k doesn't meet reserve, BTW. I hope it gets sold for good money! It looks a very nice car, but mine is much better... ... it`s mine!! Lovely car! I'm anxious to see how it sells also. I noticed that one of the pictures was already in my file from 2006. I also notice many things characteristicly Vintage Z and / or Pierre. Haven't seen a VZ on the market in quite some time. Doug, if you bought the 350, you could at least drive it. For the value of the VZ to stay steady or go up, you wouldn't be able to drive it much. I saw that car a WCN last month. As good as they are the pictures don't convey how nice this car looks. Worth every penny in my book. I have to put my sincerely toughts about this car that I already started to say something listed above. My restoration program, make me spend much money on parts and seraching of perfection and new parts. As "westpak" said there is some parts on the car makes me think that I probably did a restoration better them this on my car. Many pictures are missing here, I probably will be critisized, but thatÂ´s my toughts. DonÂ´t get me wrong, a vintage Z will be always a Vintage Z, but I think my car is better them it car that is for sale. 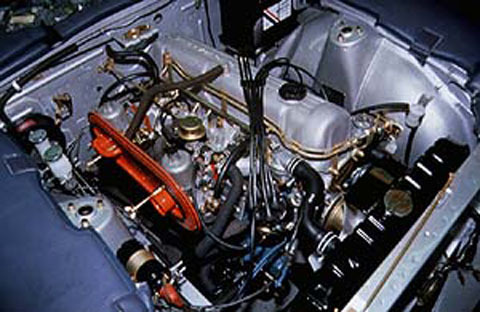 Your reasoning is the reason Nissan stopped the program early-they found out that the restomod costs were more than they bargained for even taking some reasonable shortcuts. When commitment leads budget, the job details will almost always be better than when Budget curtails commitment. These cars are important because of what they are(a manufacturer establishing a program to refurbish and resell their own used cars as new ones), not the level of detail in their restomod. I can't bring myself to call the program cars resorations because Nissan had the ability to truely restore the cars and clearly chose not to-No Z in the early seventies came from Japan with a program plaque on the console, program stickers on the windows, or a certificate of authenticy-much less reprinted manuals. The car in this thread is a beautiful example of a program car-not a true Restoration. Compare a Program car to a true #1 stock class car they are not the same. The best kept unaltered Program car will lose points (for the nonstock items added by the program) in the stock class of a ZCCA show, and not loose any in the modified classes-meaning as a restoration, it does not measure up-clean or not. That doesn't mean I don't want it! The alphabet begins w/ Z. In my opinion part of the allure of the VZ's is historical. Aside from the obvious fact that it's a Z, what else makes these cars special is the fact that no other car manufactuer ever had a program like this. That in itself make these select 240's unique. You are doing a wonderful job on your Z - it is truly beautiful. You are also doing it in a part of the world where obtaining the needed/desired parts is most difficult. 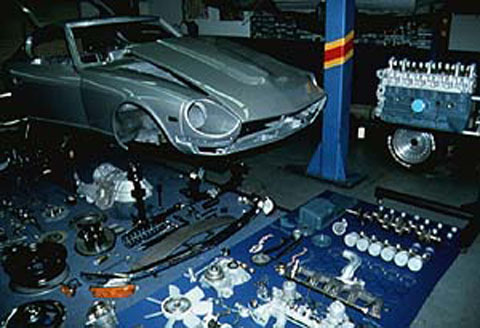 If you have found and purchased 500 New Old Stock (NOS) parts - you have now replaced about one third of the NOS parts that Nissan used on each of the Vintage Z's. Your English is nearly perfect. 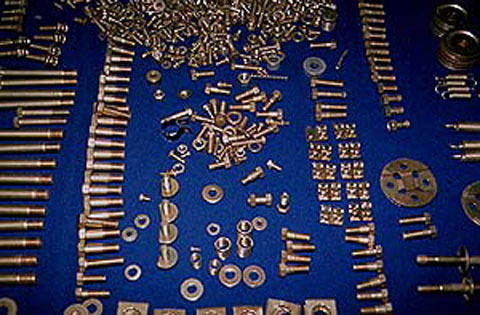 Many of the new parts you bought, you were able to buy because of the Vintage Z Program. 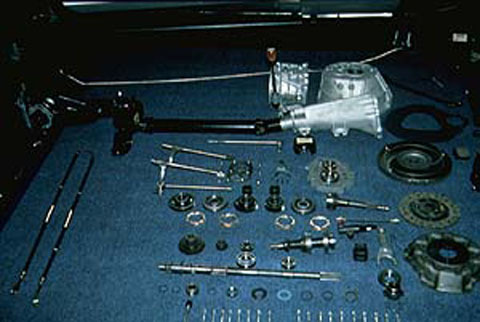 Nissan worked with aftermarket suppliers to have OEM quality reproduction parts made for the Vintage Z Program, and for people like you and I to be able to buy. All the interior plastic panels, the seat upholstery, the diamond vinyl upholstery, decals, rubber bushings, sheetmetal replacements for the rear hatch threshold among many others. If you had a Vintage Z, you would have one of the 38 cars completed during this very unique Program. When you are done, you will have a very beautifully completed 240-Z, and certainly very rare example in Europe. However you will have one of several hundred restored 240-Z's. I'm not criticizing your thoughts - only I believe you have a basic misunderstanding of the extent Nissan went to when they remanufactured the Vintage Z's. Many people also believe that they would rather have a Restored 240-Z, than one of the Vintage Z's. Everyone is entitled to own what they want. Many people would rather do the restoration/refresh/restromod themselves and that is wonderful as well. "Better" is a very subjective term. If you think your Z is better, then that is certainly true for you and many people would agree it is better for them as well. I believe that for the money paid - $35K to $40K a Vintage Z represents a better value today, and they will most likely represent higher values in the future. I agree with Carl's comments above. The VZ has historical value that a owner-restored Z will not likely have. Personally, I don't understand why you hijacked this thread. If you want to do a thread about your car then do a thread about your car. Oh, wait, you already have done several threads about your car. This thread has nothing to do with your car. Your car is nice, and I applaud your efforts but it really has nothing to do with the car being discussed here. Your car is nice, and I applaud your efforts but it really has nothing to do with the car being discussed here. Maybe not, but it was still interesting to read the response from Carl, that clearly points out the extent of the restoration process that these "program" cars went through in comparison to FilipeA's restoration. If anything, this intrusion served to enlighten me somewhat. Thanks eveyone! This has sure been an interesting road to travel so far and it's only been one day. To all that have commented, thank you. I keep getting emails from people who tell me they sold or bought their Z for significantly less and that I'm dreaming if I think I can sell it for this. Well, I guess everyone's entitled to an opinion, but I have no idea why anyone would take the time to write an email like that. It just seems weird. Do you think they'd complain if their neighbor sold his house for a really high price so the value of their house went up too? Hmmm, I just don't get it. All of your comments have seriously started me rethinking this decision, so don't be surprised if I change my mind about selling it. About the gas tank, I'm embarrassed. I used a shop rag to wipe it off and some of the red lint pulled out into the undercoating. I need to clean it off again with a towel. The flash really makes that show up. Bad on me!!! FYI, I think there are something like 47 people watching the auction now. Good luck with the auction, my Orange one went last month on ebay and I know what you mean about all the nut job questions.....I'm curious from your description, what car are you "lusting" for? That car is too beautiful, special, and desirable to let go! ...snip.... I keep getting emails from people who tell me they sold or bought their Z for significantly less and that I'm dreaming if I think I can sell it for this. That's EXACTLY what I've been telling people here for years! Personally I hope that you DO get that and more! More to the point, I wish I had the money to bid on your car, but I don't, but if your car goes up in value, mine, even not being a VZ program car, nor even in the same "class" would go up in value too. I agree with the individual that mentioned that the real detriment to Z prices going up are the Z owners that nay-say any increase in their value. I'm not planning on selling, but I do want to garner a bit more respect for my car at open marque cruise-in's. I agree, Enrique. I've noticed that the folks who need to restore their Z want prices to stay down, while those who've finished or bought a restored one want them to go up...probably not a coincidence. The Japanese imports, the Z in particular, are getting more routine coverage in collector/classic car mags, evidenced by the big spread on Datsun in the current Hemmings Sports and Exotic (even if some key facts are incorrect). They even profiled a B210--Whahuh!? :stupid: Increasing profile should generate more demand/interest in buying, restoring and showing these cars, and their value should improve accordingly. Fingers crossed. Hopefully some deep pocketed collector is looking to catch the next rising wave of collector interest in early Asian imports and will take a liking to the VZ car listed, paying big money for it. I don't see much downside to that purchase, even at 35-40k, given its rare history and interesting storyline. Bob, don't listen to the haters. Yours is unique to the Z timeline and should be valued accordingly. Even if it doesn't sell, it may generate some buzz and get sold later down the line. I believe this is the car which sold in Nov 06, The then owner was Attorney Danny Thraikill from Mena Arkansas. I believe it sold for between 20K - 24K. I don't know and I could be wrong, but I believe I've seen that car in Bob's posession via the So Cal show circuit for longer than that. I wonder how many of the watchers are members of this forum, just interested in seeing what happens? P.S. I'm back to my good old BRG!